Premium Stackable Wine Rack by Clever Chef | Custom Wine Storage | Snap & Stack Design Perfect To Fit Any Space | Sturdy & Lightweight Black Plastic | Pack of 10 Wine Racks (Holds 10 Bottles) by Clever Chef at Verve Wine Bar. MPN: 638888949359. Hurry! Limited time offer. Offer valid only while supplies last. 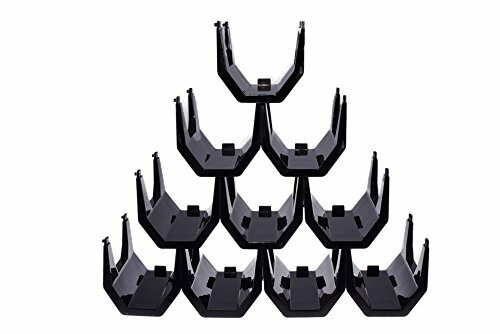 You can easily stack these wine racks infinitely both sideways and upwards due to the easy-stack and quick-snap features of the wine holder sections. You can easily stack these wine racks infinitely both sideways and upwards due to the easy-stack and quick-snap features of the wine holder sections. Snapping sections together sideways is easy and requires no additional tools. Just line up the bottom two pegs with the corresponding holes in the other section and press firmly until you hear and feel them snap into place. Then do the same with the middle peg and its corresponding hole on the other section. Stacking sections on top of each other is as easy as pressing the rectangular holes on the front and back underside of the top section into the corresponding support poles on the bottom two sections. Each of the wine holder sections is designed to fit one standard sized wine bottle and measures 6.5 x 6.5 x 4 inches. 100% Satisfaction Guarantee In addition to Amazon's standard Return Policy, as the manufacturer we offer full Refund or Replacement Guarantee for 1 (one) full year. If you are ever not satisfied for any reason, please contact us directly. Thank you for choosing Clever Chef. BEST WINE STORAGE SOLUTION: All wine lovers from the most experienced connoisseur to the newest wine enthusiast find themselves up against the issue of storage. Finding an attractive and functional way to fit your wine into whatever space you have can be a big issue. This wine holder by Clever Chef easily solves the storage problem by looking good and being nearly infinitely stackable! If you have any questions about this product by Clever Chef, contact us by completing and submitting the form below. If you are looking for a specif part number, please include it with your message.